The September update to ArcGIS Online included changes and enhancements to the map viewer and application templates and improvements for configuring enterprise logins. ArcGIS Online basemaps were also updated with many contributions from the Community Maps Program. Also, ArcGIS Online is now included with ArcGIS for Desktop (see "ArcGIS for Desktop Now Includes ArcGIS Online Subscription"). 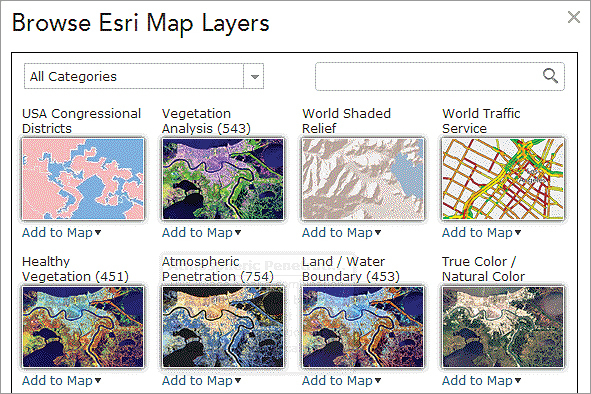 We've improved how you can access and add Esri Map Layers to your maps. 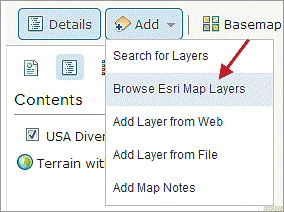 You can now access a gallery of Esri Map Layers directly from the Add button in the map viewer. 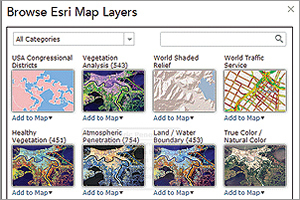 Esri Map Layers include imagery and layers about people (demographics and lifestyle), earth (land cover, soils, elevation), and life (ecology, species biology, ecosystem). You can drag and drop layers to reorder your map content. If your map includes a layer that could be updated while the map is open (for example, when your field crew is collecting data), you can now set a refresh interval for the layer. This will keep your map in sync with the latest data, even while your map is open in a browser, on the desktop, or web or mobile apps. We also improved the Find address or place locator. Now, as you type in your search terms, you get a list of suggestions that you can choose from. ArcGIS Online Help includes steps for configuring OpenAM 10.1.0 and NetIQ Access Manager 3.2 as enterprise providers. We've improved the design for configuring the organization description field. You have a View HTML Source option to more easily create a description with HTML. World Topographic Map—New and updated content received through the Community Maps Program was added to the World Topographic Map. New content for the United States includes El Paso County, Texas; Lewis & Clark County, Montana; Las Vegas, Nevada; Kittitas County, Washington; University of Wyoming, Wyoming; and University of Tuskegee, Alabama. Updated content for the United States includes Collier County, Florida; Denver County, Colorado; El Paso County, Texas; Peoria County, Illinois; Chandler, Arizona; York, Maine; Greater Portland, Oregon; and Tacoma, Washington. We've also added new and updated content for Canada at 9,000 to 1,000 scale for 68 communities, including municipalities, cities, towns, universities, and colleges. Comprehensive updates for the countries of the Czech Republic, the Netherlands, and France were also added. The data for the update to France came from best available authoritative sources, including IGN BD ADRESSE and IGN BD TOPO, as well as HERE and INTERMAP. Updated content for Australia and New Zealand was published in World Topographic, World Street, and Light Gray Canvas basemaps, as well as in World Transportation and World Boundaries and Places reference overlays. We continue to update and expand our global large-scale basemap coverage from 288,000 to 4,000 nationwide in the United States and to 2,000 and 1,000 in select areas.